I apologize for the late post. 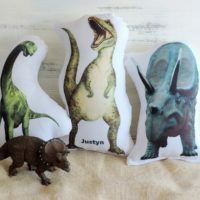 I have been so crazy busy working on custom orders, settling in at the new shop space and juggling family life. 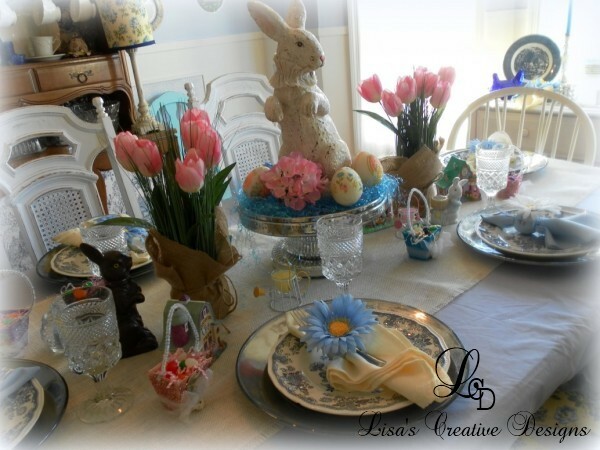 This Sunday is Easter and I have FINALLY finished decorating for spring in the dining room. 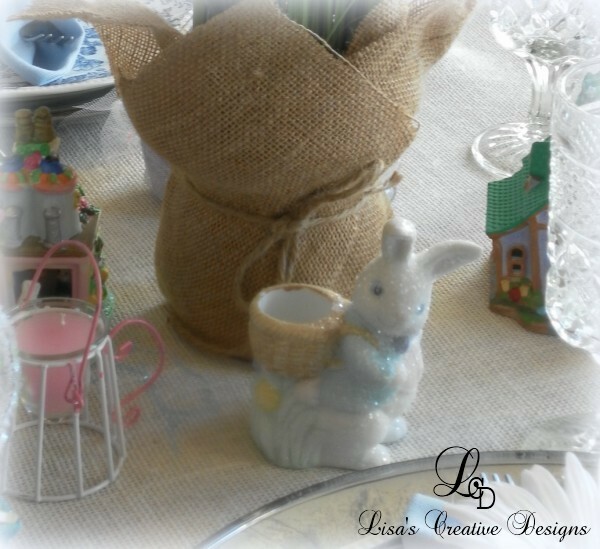 Today I would like to share with you my Easter tablescape. 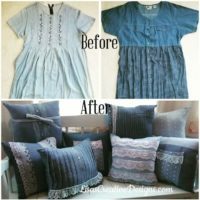 I started out with a periwinkle blue tablecloth. (shhh, it is really a flat bed sheet!) I then layered on a burlap table runner I made. I picked up a couple of yards of burlap at Walmart for about $3.99 a yard. I cut it to size and sewed a straight line down the edges to keep it from unraveling. It was “sew” simple. 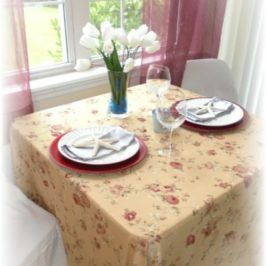 When in a pinch flat bedsheets make great tablecloths and even curtains. 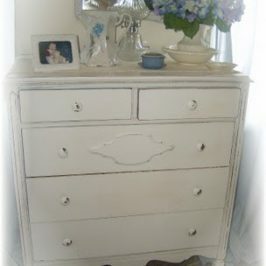 Whether new or vintage, they come in a myriad of colors and patterns. They are also budget friendly solution if you need alot of yardage for a particular project. 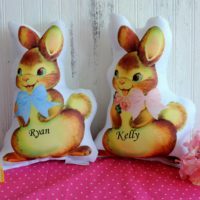 I found this vintage style bunny rabbit at Marshall’s for $12.99. I didn’t want a bunny that was too “Eastery” with eggs or anything so I can keep him out all Spring. I sprinkled him with glitter and perched on my mercury glass cake stand, I think he makes a great centerpiece for my Easter tablescape! 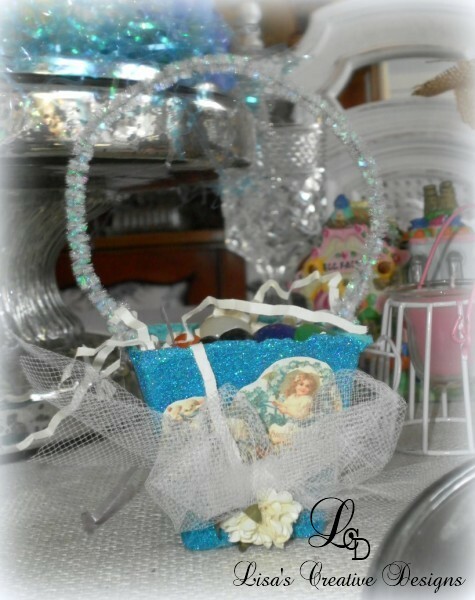 I nestled him in blue Easter grass, added a couple of silk flowers and then tucked in some vintage glittered foam Easter eggs. Aren’t they cute? 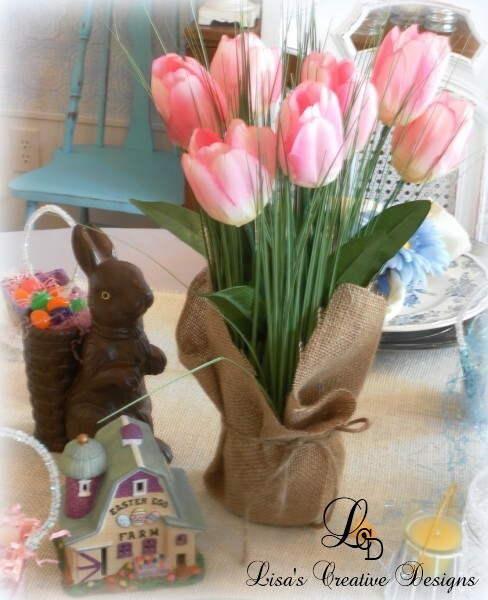 The potted silk tulips came from a discount store for $3.00 each. 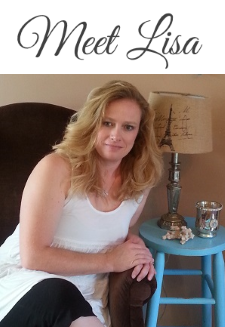 I covered the plastic flower pots in burlap too. I like the look. 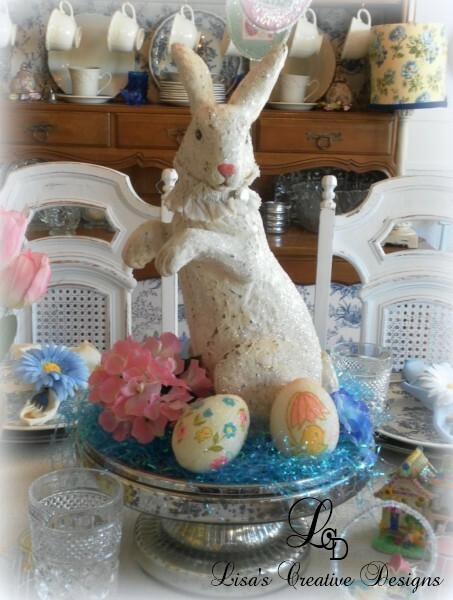 My faux chocolate Easter bunny sits on the table carrying a load of jellybeans and the miniature Easter inspired ceramic buildings add a nice touch I think. Aaah, yes! There are my beautiful mercury glass platters I created at Christmas time! I just could not bear to tuck them away until next Christmas. 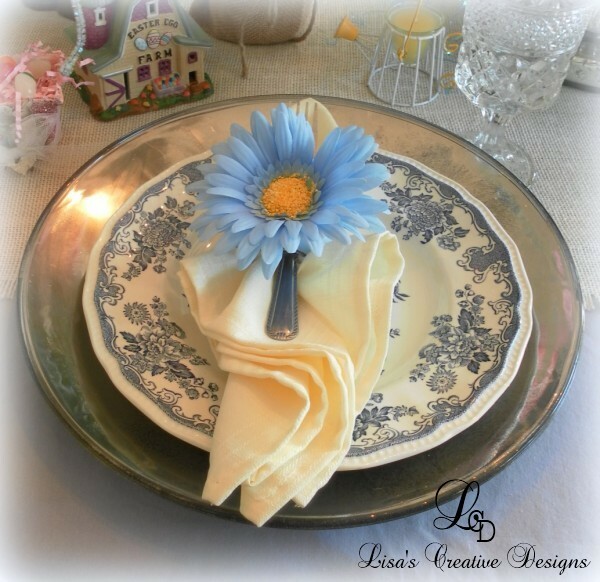 Dressed with a pretty transferware plate a spring inspired napkins, they look just right for Easter! 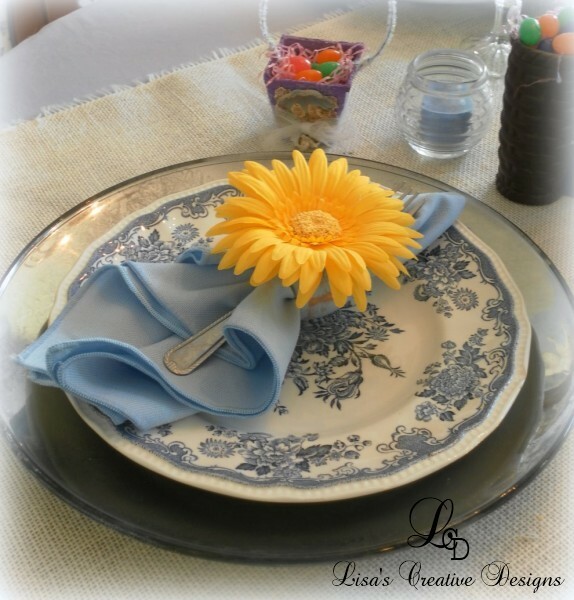 I made these Spring napkin holders with a bunch of yellow, blue and white silk daisies. 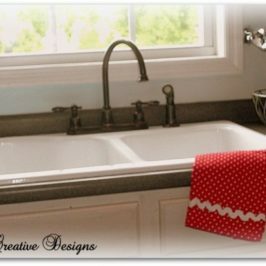 They were super simple to make and affordable. 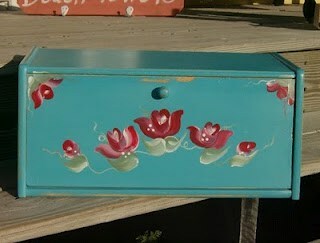 I will show you how to make your own in one of my next posts. 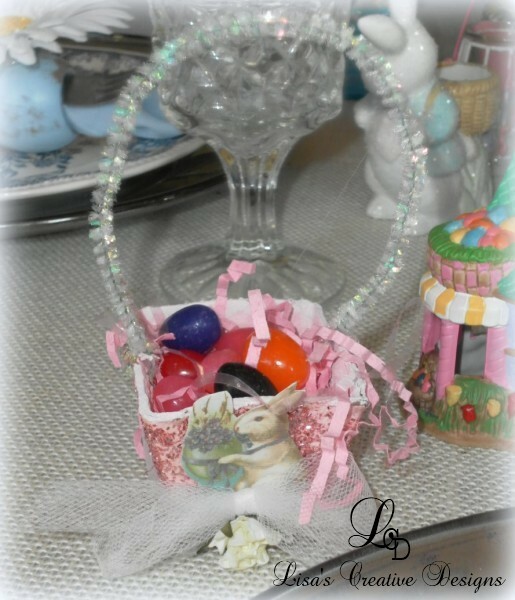 At each place setting sits an adorable Vintage Inspired Easter Nut Cup I created using lots of glitter and vintage Easter postcard images. Here’s a cute pink one. I filled each one with jelly beans for guests to munch on. 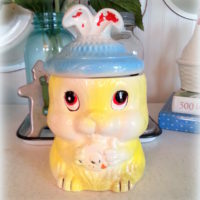 This cute little ceramic Easter Bunny figurine was a thrift store find that I bathed in glitter. I just love my glitter! 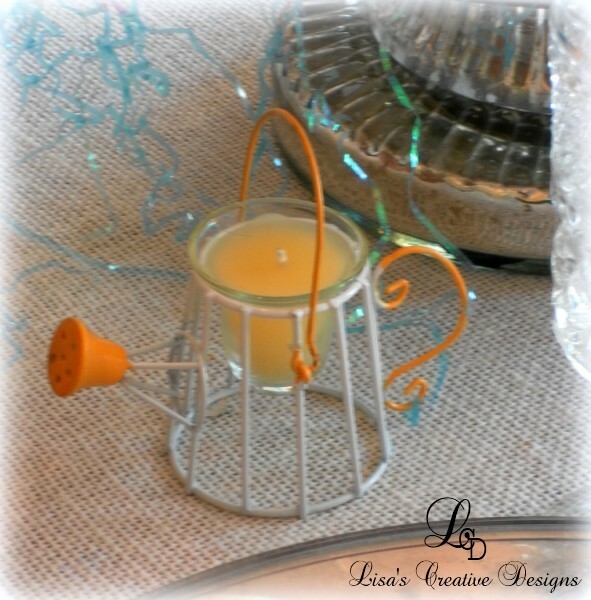 This cute wire watering can votive holder came as a set of two that I snagged at a thrift shop still in it’s original box. 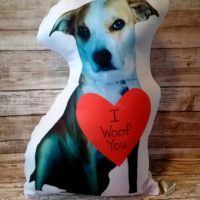 Why would someone give away something so cute?! 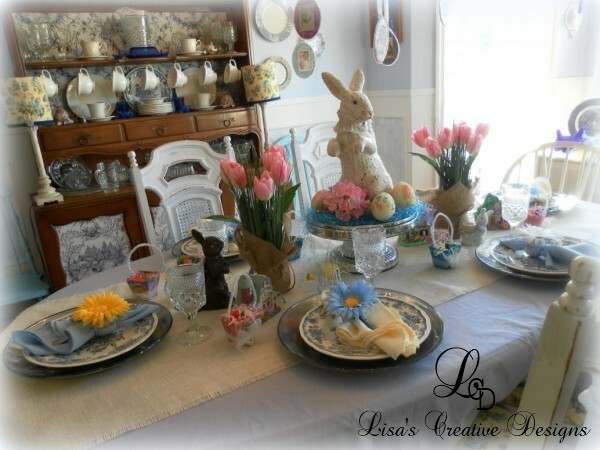 So, now that my Easter tablescape is finished I can start decorating for spring in the rest of the house. There’s nothing like waiting for the last minute! 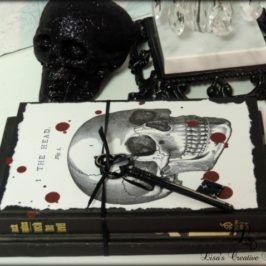 Thanks so much for visiting today! Have a wonderful Easter! 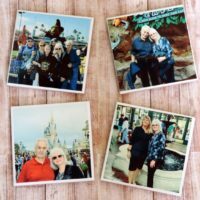 I love your napkin rings – I have made some similar ones in the past and I will be looking forward to seeing how you did yours. That is a great idea, about the bunny not being too Eastery (is that a word??). 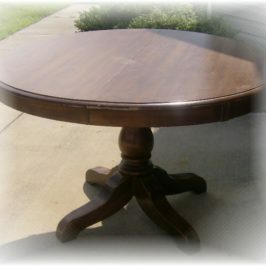 Your table is lovely and you have so many special pieces. 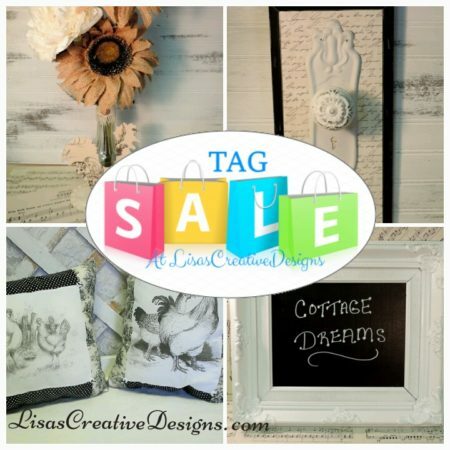 Love that watering can votive holder!